For World Water Day 2019: Leaving no one behind (22 March 2019), the UN Special Rapporteur on the human rights to safe drinking water and sanitation, Mr. Léo Heller, together with the Permanent Mission of Spain, the Permanent Mission of Germany, UN-Water, UNESCO-IHP, and OHCHR, is organizing a second online challenge to raise awareness among the youth about the human rights to water and sanitation. 1. What is The Human Rights Youth Challenge? 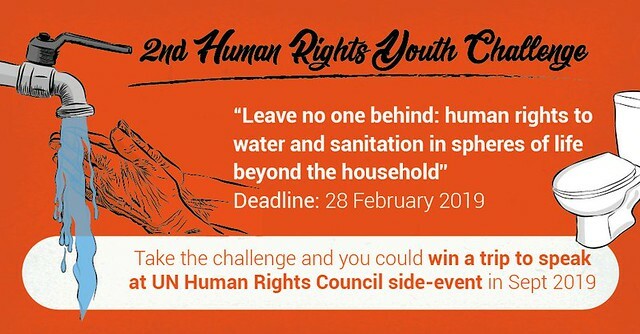 The Challenge: Show your knowledge, understanding and passion about the human rights to water and sanitation by creating an original content about the human rights to water and sanitation and upload it to a social media network (Instagram, YouTube, Facebook or Twitter). 2. What is the theme for the 2nd Human Rights Youth Challenge? The human rights to water and sanitation require that water and sanitation services must be physically accessible for everyone within or in the immediate vicinity of all spheres of their lives, particularly at home, but also in other spaces. These include places where people spend a significant part of their time or are occasionally impelled to go, such as the workplace, educational institutions, health centres and public spaces as well as those places of residence that are not strictly characterized as homes, such as prisons, public places (for homeless) and certain workplaces and dormitories in schools. While efforts have been observed on improving access to water and sanitation services in households, health centres and educational facilities, access to those services in some other spheres of people’s lives are clearly lagging behind. Many people spend a large part of their time outside the home, either at work or in commute. Sometimes, the public space is the work area for some people such as street vendors and informal transportation drivers. In other situations, the place of residence is not their own households but provided by a third party such as prisons and certain housing provided by employers. All of these situations affect the universal enjoyment of the human rights to water and sanitation and the achievement not only of Goal 6.1 and 6.2 of the Sustainable Development Goals, but also SDG 3, related to health and well-being; SDG 8 referring to decent work for all; and SDG 11, related to safe and sustainable cities. All persons between the ages of 15 and 24 years, as of 22 March 2019. 4. How to win The Human Rights Youth Challenge? The UN Special Rapporteur will look for content/ submission that demonstrates a good understanding International Hydrological Programme United Nations Educational, Scientific and Cultural Organization of the human rights to water and sanitation and that clearly expresses what the human rights to water and sanitation mean to youth. 5. How to participate in The Human Rights Youth Challenge? • Share your content/submission via social media channels where the UN Special Rapporteur has accounts (@UNSRwatsan on Instagram, @ SRwatsan on Facebook and Twitter). • Mark the content/submission by including the hashtag #Youth4watsan and tagging the Special Rapporteur’s account. • Upload your content/submission directly to one of these social media channels or share a link to your content on any other platforms. • Multiple submissions are welcome. 6. What is the format of the submission? 7. How will the winner be selected? Winner will be selected based on two criteria without an order of priority.First, demonstration of understanding of the human rights to water and sanitation in spheres of life beyond household and second, creativity and attractiveness of the content/submission. 8. When is the deadline? When will the winner be announced? • Announcement of the winner: World Water Day (22 March 2019). 9. What will be the prize? The UN Special Rapporteur will invite the winner to travel to Geneva, Switzerland and to speak at a side-event of the 42nd session of the UN Human Rights Council in September 2019 organized by him. In a youth panel together with the last year’s Youth Challenge winner, Asniya Mohamad, the 2nd Youth Challenge winner will address the Geneva-based UN community, introducing the submission created for the challenge and/or speaking about the situation of the human rights to safe drinking water and sanitation of his or her country. The travel cost will be covered. Browse through the publications found here and follow the UN Special Rapporteur’s social media accounts for further hints.